The sun is shining, the air is warmer (slightly) and I am ready for spring. Yay! I can’t wait for the ground to thaw and the flowers to grow. But until then, I will have to settle for just filing my home with bright and cheery spring decor. And my seasonal decorating always starts at the front door. 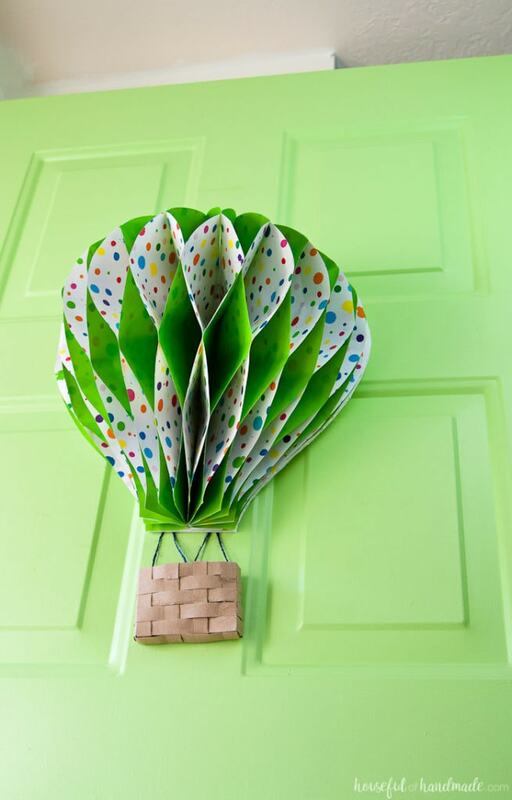 This time I didn’t go for a traditional wreath, instead I made this beautiful Hot Air Balloon Spring Wreath to brighten my door. 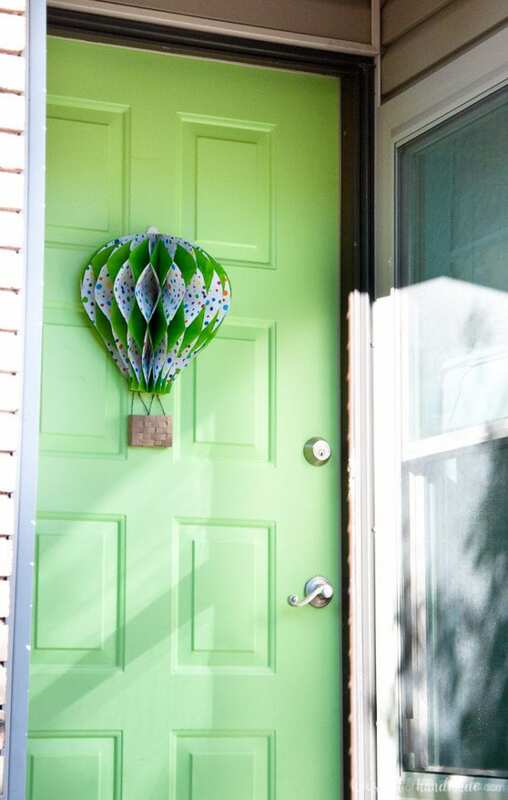 After making the giant paper ornaments for my front door a couple years ago, I have been thinking about doing the same thing with a hot air balloon. After waiting way too long to make it happen, I decided it would be the perfect DIY spring wreath for this year. Doesn’t it just make you think of warm days and having fun on the grass? As a kid I always loved seeing hot air balloons in the sky. I remember driving the ever-so-long (but really only 2 hour) drive to visit my grandparents and getting so excited when we say hot air balloons peeking over the mountains. It just seemed like a fairy tale to me. And what is spring but the same fairy tale of warm after a long winter. And while this looks like a complicated wreath, it really was so easy to make. It only took me about an hour and then I had a beautiful hot air balloon spring wreath to welcome in the sunshine! But don’t be fooled, it was still cold, but at least the sun was shining. I think that is a good sign that spring is on it’s way. 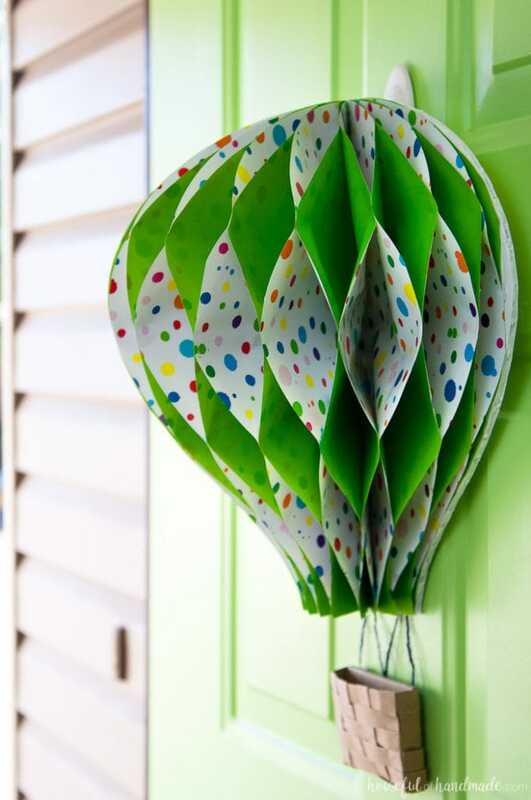 If you want to make your own Hot Air Balloon spring wreath, I am sharing the tutorial over at Oh My! Creative today. Click here for all the details. And maybe if we all wish together really hard, spring will be here quick this year! Thank you Kati for the great idea! I just made your balloon for a diaper cake! Wish I could send you my picture! Thanks again… it turned out beautiful! That sounds amazing Deanna! I love this idea. If you post it on social media, you can always tag me so I can see it (just make sure the post settings are not private). And you can always email me pics kati (at) housefulofhandmade (dot) com. Thanks Jeannee! I love that it is a bit different too. Hey, Kati! 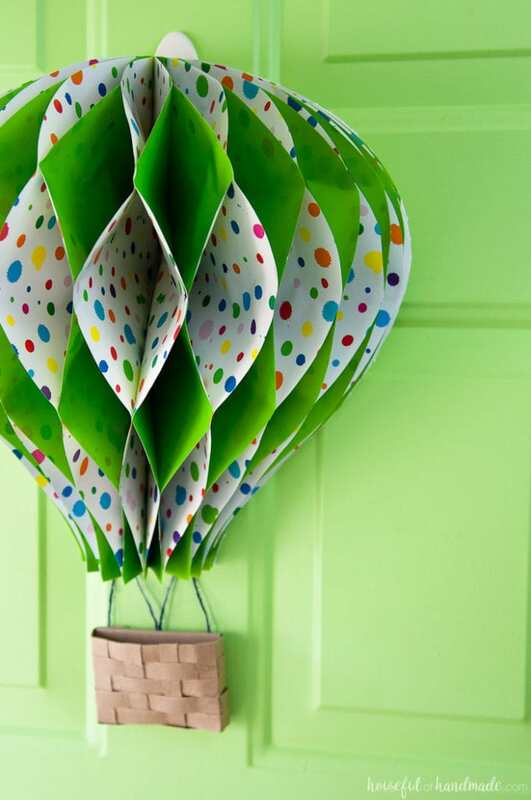 Just wanted to let you know that we loved your Hot Air Balloon Spring Wreath so much when you shared it at the #HomeMattersParty last week, we’ve FEATURED it THIS WEEK! Hope you can check it out when you get a sec. Happy Friday!!! Thanks so much Lorelai! That made my day. What a great idea! It looks so fresh and spring-like! Love the color of your door, too! Thanks! I love the door color too, perfect for spring. Oh my gosh!! What a cute idea I love this! So unique. I think I need one of these on my front door this spring! Thanks Christene! It definitely makes my front door seem more like spring, even though it is surrounded with snow right now! adorable! i think that would be so cute for a shower or other party, too. This would be great for party decor or a nursery! I love this, esp. as it’s so different from the typical “wreath”! It’s very cheerful. Wishing good wishes for spring to come. Visiting from Inspiration Monday party. Thank you for stopping by Victoria! I hope spring comes soon too. This is so cute! I just love it! This is so whimsical! Unexpected for the front door. Too darn fun! I love seeing hot air balloon in the sky. There’s no way I would want to take a ride in one, though. Thanks Fonda! It is definitely a bit unexpected, but I love that about it.